The markets in Greater China – Mainland China, Hong Kong, Taiwan and Macau – are hotbeds of opportunities for many foreign companies planning to sell their alcoholic beverages. Many consumers can purchase premium products because of the increasing disposable income. In the past years, there has been an unprecedented rise in consumption of foreign alcohols, creating a demand that many importers are scrambling to meet. In Mainland China alone, annual alcohol consumption is expected to reach 65 billion liters by 2020. 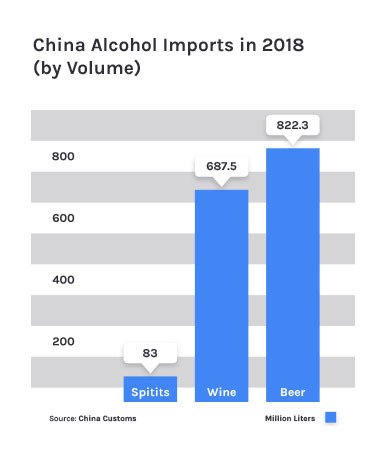 Hong Kong and Macau are prime markets for imported alcohol, thanks to the lack of duties for imports that makes market entry easier for many foreign businesses. 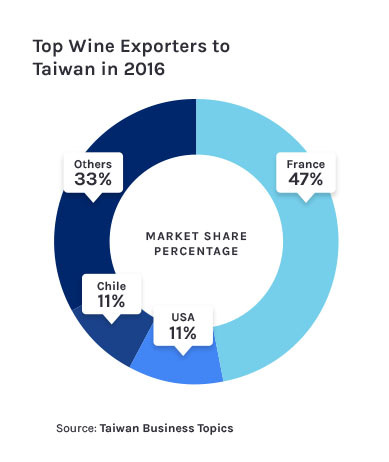 Meanwhile, Taiwan’s alcohol market continues to expand due to the high purchasing power and significant spending patterns of its 23 million people. Companies wishing to sell to Greater China must pay the required duties and follow several stringent processes. In China and Taiwan, taxes apply to different alcoholic beverages, while only spirits with an alcoholic strength of more than 30% by volume are taxed in Hong Kong and Macau. Exporters must also keep in mind the regulations set for consumable products by China’s government and other national standards. To succeed in the Greater China markets, businesses should: 1) understand the competition in the markets, 2) determine which local markets to target, 3) develop the right pricing strategy, 4) craft a successful branding strategy, and 5) find reliable local partners to achieve sales goals in the market. The experiences of Coopers Brewery and Jackson Family Wines, Australian and American producers, respectively, demonstrate the value of investing in analyzing and understanding the market. Their success in Hong Kong and China shows the return firms can enjoy when they accurately assess the market and competition and employ the time and due diligence necessary to develop strong relationships with suitable local partners who can help them establish reliable sales channels. China is one of the most exciting markets for foreign alcohol companies. Consumer spending hit at an all-time high of ¥31 million (US$4.6 million) in 2018. With a per capita disposable income of ¥26,000 (US$4,000), the Chinese are thirsty for premium alcohol and other high quality goods. Consumption is driven in large part by the growing middle class who demands better quality in their purchases. Alcohol consumption in China is at 62 billion liters and is expected to increase in the upcoming years. Annual beer consumption is the largest in the world at 45.7 billion liters. Meanwhile, spirits consumption reached 8.4 billion liters in 2016 and it is expected to grow at a compound annual growth rate (CAGR) of 15% over the next three years. At US$190.2 billion, the largest segment in China’s alcohol market is spirits. The local firewater, baijiu, takes the biggest share. Over all, the market held 32.8% of the global share and 52.3% of the Asia-Pacific regional share in 2016. The region’s beer market is projected to reach US$99.3 billion by the end of 2019, while the wine market is also booming, with sales expected to reach US$21 billion in 2020. Hong Kong is one of the most affluent markets in East Asia. Consumer spending is high and is expected to reach HK$1.95 trillion (US$251 billion) in 2021. There is a huge demand for foreign goods among consumers. The growing Hong Kong middle-class have come to expect the best in their purchases, buying based on quality and taste rather than price. Alcohol consumption per capita in the region is one of the highest at 2.87 liters. The surge is primarily due to the elimination of duties for imported alcohols in 2008. Consumers show preference for international brands. 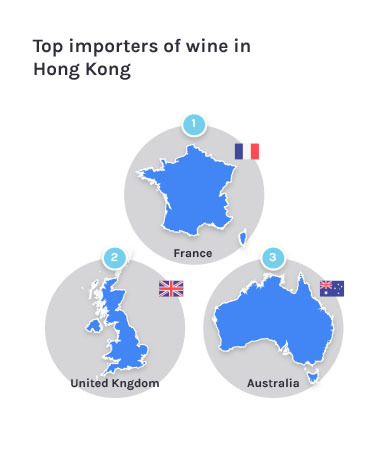 Hong Kong imported 28.8 million liters of wine in the first half of 2018, mostly from France, the United Kingdom and Australia. Meanwhile, imports of gin and liqueurs posted year-on-year growth of 7% and 23%, respectively. Liquors with an alcoholic strength of more than 30% by volume are the only alcoholic beverages subject to excise duty in Hong Kong. There is no duty payable for wine and beer (or those beverages less than 30 percent alcohol by volume). Products that are to be re-exported and not consumed in the region are also not subjected to excise duty. Likewise, importers do not need to pay any value-added tax (VAT) or goods and services tax (GST). Taiwan’s smaller and more homogenous market of 23 million people is highly attractive for foreign alcohol companies. Consumers spending is at an all-time high of NT$232 million (US$7.5 million). The considerable rise of young urban dwellers and white collar workers has paved the way for the increased consumption of imported alcohol. Over the years, the Taiwanese have developed a taste for premium and imported alcoholic beverages. Its alcohol market is one of the fastest-growing markets in the world. Imports of wine and spirits reached US$837 million in 2016, while shipments of foreign beers reached 188 million liters (US$185 million). Taiwan imposes relatively high taxes on imported alcoholic beverages. Importers must pay a rate of NT$185 (US$6) per liter for products with an alcohol content of over 20%, plus a custom tax of 40%. For beverages with less than 20% by volume, like wine and beer, the rate is NT$ 7/liter per degree of alcohol content. An import tax of 10% and a Goods and Services tax of 5% are also applied. Macau has one of the world’s biggest per-capita economies. By 2020, its GDP per capita is expected to reach around US$143,000. Consumer spending is at MOP 2.6 million (US$ 321,789). Macau is a prime tourist destination, with around 32 million visitors every year. Its gambling and leisure sector creates a huge demand for food and beverage products. In 2014, Macau’s wine imports reached MOP 1.4 billion (US$173 million). High-quality vintages, both from the Old and New World, are popular with tourists and locals. In the first months of 2017, the city imported about US$1.8 million-worth of beers, with preference for those with higher alcohol content. There is also a growing thirst for cocktails. Like Hong Kong, Macau is a free port with no tariffs on general imports. It does not impose duties on beverages with alcohol content lower than 30 percent by volume, like wine and beer. Meanwhile, those exceeding 30 percent of alcohol content are subjected to a consumption tax of 10% CIF value plus MOP 20 (US$2.5). If the alcoholic beverage is less than 1 liter, no consumption tax is applied. All the Greater China markets — Mainland China, Hong Kong, Taiwan, and Macau—are competitive in unique ways. Many firms fail because they don’t understand the competition in the market(s) they want to enter. Companies can better understand existing competition and overall potential for their product in the market by commissioning a detailed analysis of the market size, growth outlook, competition in their target price range and for the product type, and receive professional guidance regarding strengths and weaknesses. Pricing is one of the most important factors impacting consumer decision-making, yet it’s common for companies to set prices or work through distributors without knowing if their price is right for their target market segment and customer. You can know how your price compares to the average retail price nationally, in each of your target local markets, and compared to competitors’ for your target price level (e.g. premium) by carrying out a proper Market Pricing Analysis (MPA). With a good pricing strategy, your product will to stand out among competitors’ and enjoy higher sales and growing popularity among consumers. You want to know if a potential sales partner is reliable, trustworthy and capable of helping you achieve your goals in the market. However, foreign producers have difficulty assessing the true capabilities, trustworthiness, and suitability of individual local distributors for their company and product(s). Carry out due diligence before any contracts are signed so you save time, trouble, and money in the long run. A Distributor Due Diligence Assessment takes the mystery out of choosing a local sales partner by finding businesses with a track record in the industry confirming key details about their business, capabilities, potential risks, and providing clear recommendations as to whether they are right for you, your product, and goals. All the Greater China markets are unique and complex. Yet, many companies try to enter the market without knowing where their product is likely to find the most success, who will buy it, and who they should be working with to sell it. Knowing your target market, ideal customer profile, and the type of sales partner that best fits your needs is key to success. For Mainland China, in particular, it can be difficult to know where to start in a country of nearly 1.4 billion people. Carry out a Target Market Analysis (TMA) to identify the best local markets (e.g. Beijing) for you to focus on, know the detailed profile of your ideal customer (e.g. buying habits) and receive guidance on the type distributor you should work with. Knowing these things will allow you to make better decisions and enjoy a higher return on your investment. To enjoy long-term growth, brand recognition, and added brand value a company needs to prepare their branding for the target local market. Even some wealthy companies with famous brands start trying to sell products without first checking if their branding is right for the market and target customer. Avoid common missteps and confirm whether your existing branding is right for the market by performing a Branding Analysis. Look at your labelling, packaging, messaging and other brand assets—and measure how it compares to competitors, determine the best course of action to differentiate your brand and make it appealing to both your likely sales partners and target customers. 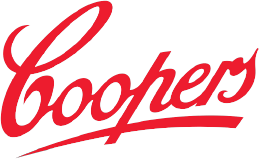 Coopers Brewery is one of the largest independent brewers in Australia, holding roughly 5% of the domestic beer sales. It is a national brand in Australia, known for its Pale Ale and Sparkling Ale, as well as a wide range of homebrew kits, including English Bitter, Dark Ale, Real Ale and Lager. Coopers has more than 500 breweries across the country and is exporting to Europe, Americas and Asia. In 2015, it first entered the Hong Kong market. Coopers beer was introduced to the Hong Kong consumers by AR Importers Ltd. The importer was looking for an authentic South Australian brew to add to its distribution selection. Since the region is a free port for wine imports, bringing the brand to the market was easy. Compared to other craft beers in AR Importers’ list, Coopers is more mainstream and popular among Hong Kongers. The beers are sold in big retail shopping outlets like Wellcome, Market Place and Oliver’s. Coopers’ success in Hong Kong is due timing and brilliant marketing approach. AR Importers Ltd introduced the brand to the market when interest for craft beers was heightened, particularly among young adults. Consumers were looking for something with more flavor and variety that they cannot easily find in their local beer selections. AR Importers Ltd.’s craft beer selections were light and easy to drink, different from the brews with strong hoppy and bitter flavors available in the market. Jackson Family Wines is an award-winning wine producer based in California. Founded in 1982, this family-owned company has more than 30 wineries around the world that produce around five million cases of wine annually. Its known for its best-selling chardonnay, Vintner’s Reserve, and the Grand Reserve label. The Jackson Family Wines portfolio includes 40 brands that are sold in 88 countries. China is one of Jackson Family Wines’ biggest markets in Asia. The company has been withdrawing from lower end markets in recent years, preferring to focus on the more lucrative ones. Jackson Family Wines’ products can be very expensive since they are sold only in U.S. dollars to avoid exchange rate issues. Compared to other countries, China is particularly attractive since the local consumers are willing to pay higher prices for wine. Jackson Family Wines derives only about 6% of its revenue from exports. Its average Free On Board (FOB) case price has risen over the years, currently amounting to US$150. A bottle of Chardonnay that sells for US$17 in the US can cost around $116 in Asia. While direct-to-consumer sales are much more profitable, the company continues to bank on the rising demand for quality wine overseas. After studying the market, Jackson Family Wines figured out its target consumer profiles – China’s fine wine lovers and connoisseurs – and centered its marketing strategy to cater to this group. It has also invested heavily in digital marketing to reach out to a wider range of consumers. The Greater China – Mainland China, Hong Kong, Taiwan and Macau – continue to be prime markets for imported alcohols. The demand for better-quality beverages is rising as younger and wealthier consumers keep up with the trends and embrace the modern lifestyle. Companies wishing to sell in China should: 1) evaluate the competition, 2) determine which local markets to target, 3) examine how product’s pricing compares to the average national and local market prices, 4) analyze branding including labelling, packaging, messaging and other brand assets, and 5) carry out necessary due diligence to find a professional local partner to achieve sales goals in the market. Competition is best be evaluated through a Competition Analysis where product is assessed in terms of growth outlook, varietal and price, then compared to existing brands in the market. The best local markets for your product can be identified through the Target Market Analysis (TMA) as well as the profile of the ideal customer for the product and guidance on choosing the right kind of distributor. Market pricing, strategy and how they compare to the competition can be assessed through a Marketing Pricing Analysis (MPA) providing a clear picture of your product’s place in the market, relative to existing competition, and what you can do to best position yours for success. Knowing how well your existing or planned branding will support sales growth and what you should do to maximize your chances of success can be shown in a detailed Branding Analysis where the product’s brand assets are assessed compared to competitors’ in the market. Although finding a reliable distributor can be challenging, particularly for small and medium-sized producers, carrying out due diligence can ensure you know if you are working with the right company. A Distributor Due Diligence Assessment examines a distributor’s track record, operations, facilities, licenses and more and provides a useful risk assessment and recommendations. With these tools, expertise, and support, you will be setting yourself up for long-term growth and success in whichever market you choose to do business.